Raising a family is hard. 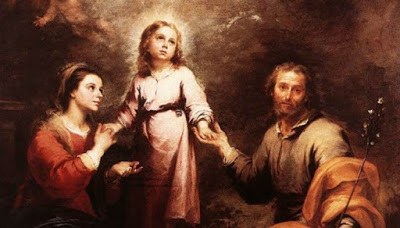 Raising a family in imitation of the Holy Family sounds impossible. And yet the prayers of the Church tell us that that is the model. We do we do with that? The Word is made flesh. The eternal Lord enters into time. God is made man. We fall down, bow, adore, worship, revere this miracle-in-a-munchkin. But we already bow a lot at Mass; what do we do on this day then, in the face of their mystery? You super-duper bow. You genuflect. You hit the floor. 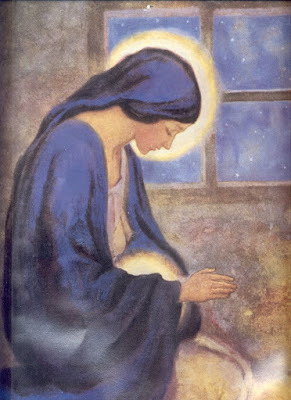 At the feast of His incarnation (March 25) and the feast of His birth (December 25), we hit our knees. 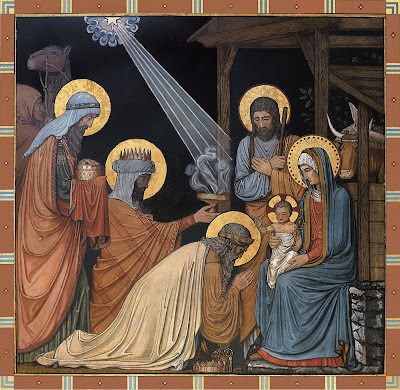 But there we learn to our surprise and delight—as the first wise man does—that this also puts us face to face with the adorable little newborn savior. God wills our good. But we are dumb. God loves us intensely. But we can hardly see it. God doesn't need, or really even care about, our sacrifices. But we can't figure out that what He really wants is a humble heart—a will—that loves as He loves. The author of the Letter to the Hebrews is saying the Son of God took on a body, became incarnate, was born at Bethlehem to remedy this: With a body, we can see His generosity and good will, we can see his love on the cross, we can understand what a heart that comes to do the Father's will looks like. So you need a Christmas to you can have a Calvary. For today’s homily we’re going to look at the second reading, the Letter to the Hebrews. And I won’t lie, this reading feels a little out of place. So here we are, it’s the Fourth Sunday of Advent, we’re a day and a half from Christmas, and finally things are really, really Christmas-y. At the beginning of Advent, you don’t always get a super Christmas-y feel; it’s more cosmic that Christmas-y. We’re talking about Jesus’ second coming, we’re talking about being prepared for both His comings, and there’s a lot of stuff going on. And as little kids, it’s hard, because we instantly want angels and shepherds, but nope, the first couple of weeks slowly tease us and let us gently move forth in that direction. So by the Fourth Sunday, we are in all out Advent assault on Christmas, we’re ready. We’ve got the first reading talking about Bethlehem, the smallest of the clans of Judah, and that the ruler will come from there, “therefore the Lord will give them up until the time that she, who has to give birth, has borne” that one- It’s very Christmas oriented. 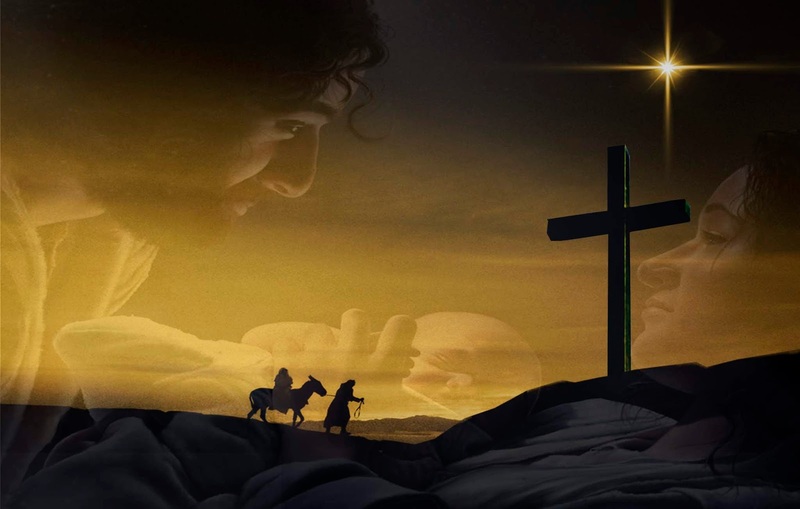 The Gospel is Mary and Elizabeth with babies in their wombs, and John’s jumping up and down, he’s excited that his Savior has come to his very own door. It’s very Christmas-y. But then the second reading feels a little odd then, because it’s the letter to the Hebrews. And I think we had the Hebrews two months ago- it’s a lot about the temple and priesthood and animal sacrifices and stuff like that. And that’s a little out of place. It might seem to fit better with Eastertime, or Good Friday or Holy Thursday, because it’s focusing on that sacrificial aspect. And even the part we read here does that. But I think we will see here that it does fit perfectly with the fact that we’re right on the cusp of Christmas. So, what does it say? behold, I come to do your will, O God.'" That is a direct quote from Psalm 40. So here we have the author of Hebrews, in the New Testament, quoting at length Psalm 40 from the Old Testament saying “this is why Jesus came.” And it’s an interesting sort of thing, because at this time we always focus on a helpless little baby, it the womb and in the cradle, but before that happened, God, the second person of the trinity, with all the knowledge, power, and fullness of divinity, made a choice to enter into our world, and He puts on His lips Psalm 40. I don’t expect that we should think that little baby Jesus came out of the womb singing Psalm 40, but these are the words that He had as He “came into the world.” Luckily in the next paragraph the author explains why he says that, why he brings this up, and why Psalm 40. “These are offered according to the law. That’s the interesting part, because Psalm 40 says “You don’t need those sacrifices, you need someone who will do your will.” And this follows the Psalms in other places, it’s more about where our hearts are at, the choices we make, our hearts being broken and contrite, our hearts being humble before the Lord, that’s the real sacrifice. The sacrifice of humility that God wants, not just more and more piled up animal carcasses. Now we understand why this is a Christmas reading, God loved the people of the Earth, especially Israel. If God is just God in the heavens without a body, it’s hard to see what that looks like. But when God, the Second Person in the Trinity enters into our world, enters into time, and comes to Earth, He takes on a body forever. But the Father doesn’t have a body, the Holy Spirit doesn’t have a body, and the Son didn’t have a body until the Incarnation. God can say He loves us, He can really love us as no one else can, but we’re kind of slow, it’s hard for us to understand. How do you know your mother loves you? She does certain things for you. How do you know your father loves you? He does things for you. If your sibling breaks their chocolate Santa in half and gives part of it to you, you know that they love you- it’s a sacrifice. And if there’s no body, if it’s not in the material world, it’s hard for us to understand love and sacrifice. God loves us forever, but still, we’re kind of slow, so what happens? he will sing joyfully because of you! In the Hebrew scriptures, God almost always refers to himself with masculine imagery—father, husband)—but his people (and later the Church) are sometimes describes as his children, his son, and—especially when Zion is spoken of—his daughter. Gaudete Sunday isn't just a day for us to rejoice in God, but when we realize he rejoices over us as a father does over his beloved daughter. I’m not gonna talk about Jesus today. I’m gonna talk about the first reading from the prophet Zephaniah. He’s one of the minor prophets, we don’t get to see him very often, he pops up just a few times over the years, but it’s a great one from him- It’s Guadete Sunday- it’s the Third Sunday of Advent, we’re over half way to Christmas, actually, more than 2/3rds. Rose Candles, rose vestments, it’s a time of rejoicing. Two cool things to catch from today’s reading, one at the beginning, and one at the end. So at the beginning, look what he says: “Shout for joy, O Daughter Zion; Sing joyfully, O daughter Jerusalem!” There’s a lot of joy, it fits with the theme, but who is he talking to? He says “O daughter Zion, O daughter Jerusalem.” That’s an interesting thing, to call her a daughter. So let’s talk about gendered language in the Bible, specifically in the Old Testament. God Himself doesn’t have a gender because he doesn’t have a body. Jesus takes on a body at the Incarnation so he definitely is called a “he,” always. But before that, He, and the Holy Spirit and the Father, don’t have a body so they’re not properly gendered, but God always reveals Himself using “He.” All throughout the Old Testament, God always reveals Himself in a masculine way. Often times then, the people are described in feminine terms, but not always. Sometimes they are “His children,” sometimes they are “His son,” often times though, and especially when we talk in certain ways, the description is feminine. Sometimes, He describes that he is going to marry Himself to them. That makes sense, it’s a covenant, and marriage is an example of a covenant. Sometimes the language again is childlike, but especially when we talk about Zion, it’s always “daughter.” Now don’t be confused, don’t be all “wait you said we’re talking about marriage, but now you’re talking about ‘daughter,’ that’s weird.” No. It’s a metaphor. Again, God always uses masculine for Himself, but when He uses metaphors, it can be different. In Isaiah, He sometimes uses even motherly metaphors. God is described as being a mother who is worried about her child, or wanting to gather her children to herself, or the longing she has for a child. Those are metaphors. But it seems like, most of the time, when referring to Jerusalem or Zion, the expression is “daughter-ish.” This even gets taken up in the New Testament- we always refer to the Church as a “she.” But here let’s focus on this daughter idea, that God has this daughter that he’s saying to be joyful. That makes sense. Notice the joy is going a different direction now. The Father, God, is rejoicing over His daughter. “He will rejoice over you with gladness, he will sing joyfully because of you.” That’s just a great image when you pair this with the beginning of the reading. Because you have this Father singing over His daughter, rejoicing over His daughter. And you can picture it, whether she’s a little baby in the crib and he’s looking over her, singing her a lullaby, rejoicing over his daughter. That’s what Zion is like. Or she grows up and she’s 5 years old and puts on her favorite dress and comes dancing around the living room, she twirls for dad and puts on her favorite tiara, like “Dad, do you like my dress, do you like my dance, do you like how it twirls?” and he rejoices over her, he sings over her, he’s proud of her, he’s excited. “I love your dress, I love how you dance, I love how it twirls.” And then even as she grows up, and he’s ready to let her go out of the house, there’s still that singing over her, that joy over her. Just last Saturday, I got to do a wedding and every wedding we have the same thing. The Father leads the bride down the aisle, and yeah, he’s going to hand her off, he’s gonna say “that’s right, boy, she’s gonna call you now when she has car trouble.” There’s a certain surrender there, but it’s a joyful sort of thing. And that last moment, that last hug, those last words, there is a singing over his daughter, a rejoicing over his daughter. So it’s cool- at the beginning, the daughter is told to be joyful because God is there, and exult in her heart about her Father. We’re told that it’s not just one way- God rejoices over us, Zion, Jerusalem, and His Church, His people. He sings over us, He’s filled with this joy and delight. That’s an awesome image to have for Guadete Sunday, that it’s both directions. We’re going to come to Christmas here really really soon. And yes, there will be rejoicing in the moment when the angels and the shepherds and Mary and Joseph all come to rejoice, but know that God is rejoicing too in that moment- He’s singing over His people, and really, sending His Son to be our savior is His ultimate way of really singing and rejoicing over His people. 1) If it feels like your Confessions are boring, you probably need to be going more often. Believe it our not, you'll have better, more interesting, "more exciting" sins to confess the more frequently you go. Try it! 2) Confession is like sandpaper. Listen to learn more. 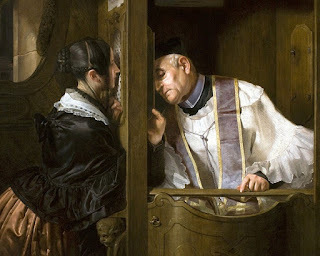 3) We have extra confessions M-F 5:00-5:30 PM. Putting this up quickly today since I think there are probably people who are shut in by snow and ice. One thing I forgot to mention as an Advent prayer/preparation is time before Our Lord in the Blessed Sacrament, whether quietly on your own, in a holy hour (7:30 PM on Mondays here), or coming early before Mass (we have exposition for the 90 minutes prior to the early weekday Mass). Oh, and here's a link to listen to that Advent playlist.